Dr. Donald Warne is now favorably positioned to become majorly responsible for squashing American Indian health disparities in North Dakota. Thanks to a $1.4 million grant, North Dakota State University now has the resources to fund its brand new American Indian Public Health Resource Center, which will officially begin work on Aug. 1. Warne, director of NDSU’s Master of Public Health program and the new center, said he’s feeling very optimistic of its potential to help our struggling native population. In fact, it will be the only American Indian public health resource center in the country. Dr. Warne, a graduate of Harvard and Stanford, said the recourse center will partake in a “multiple armed approach” to public health by tackling health education, health research, health policy and health services. One example Dr. Warne gave of the disparities was in his TEDxFargo talk last Thursday, July 24. “Here in North Dakota, if we look at the prevalence of diabetes, we can see that American Indians have about twice as much diabetes as the white population,” Warne said in front of a packed house at The Fargo Theatre. Dr. Warne, a South Dakota Pine Ridge Reservation native, explained there are a number of challenges for American Indian populations in becoming healthier. One is the access to healthy foods. Years ago, Native Americans had easy access to an abundance of traditional foods like free-range buffalo meat and blood-sugar-lowering types of corn and beans through hunting and gathering. Nowadays, in most Indian reservations, gas stations double as grocery stores, meaning easy access to sodas, chips and other prepackaged food. So one major solution would be to make sure healthier food choices are easier to access. The challenge, of course, is that healthy foods cost more, especially in impoverished communities because of the cost of transporting the food. “So ironically, people who have less money have to pay more for healthy choices,” Warne said. Again, these are all challenges the new American Indian Public Health Resource Center is ready to take on -- and are already being taken on by NDSU staff, community leaders and tribal leaders. And in order to be truly effective, Warne said he’s made sure to hire a culturally sensitive staff. NDSU’s Dr. Donna Grandbois is also helping lead this Native American wellness movement in North Dakota.A native of the Turtle Mountain Chippewa Indian Reservation, Dr. Grandbois grew up fighting against the odds and those who told her she wasn’t meant to succeed. Today, after receiving her RN, masters and doctorate, Dr. Grandbois is the first Native American nursing faculty member to be tenured in the state of North Dakota. One of Grandbois’ goals is to make sure more Native Americans have role models – people to tell them they actually are capable of achieving their dreams, especially because of what she’s had to overcome as an impoverished, marginalized child. Cultural sensitivity is something Dr. Warne said modern medicine lacks. “Physicians” only heal patients’ “physical” ailments and completely ignore patients’ emotional, mental and spiritual health. And in order to be truly healthy, we must be balanced in all areas four areas. 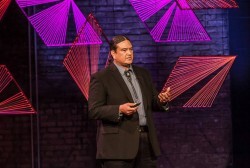 At his TED talk, Warne showed a picture of one of his ancestors, a “medicine man,” touching and praying with a patient outdoors in front of his family and community. It was a powerful form of spiritual and traditional healing. “For those of us who participate in traditional ceremonies, the power that you feel when you know your whole community wants you to be better is indescribable,” he said in his speech. This may never happen in a doctor’s office today, but even an awareness and sensitivity of these various backgrounds in modern medicine can be effective. Dr. Warne said to HPR that the resource center is committed long term to bringing resources, expertise and evaluation to tribal communities. Stay tuned to ndsu.edu for updates on the center’s progress.